We are developing aircraft for Flight Simulator since 2001 and, according to our old Groundcrew Design Group motto, always aim to be "....one pixel ahead". Pay easy and safe withPaypal. Messerschmitt Bf 108 Service Pack 2 released. Service Pack 2 includes improvements and new features as well as some bug fixes. New simconnect module fixes occasional crash on exit issues some users experienced. Default Bendix 2d popup radio replaced with a new Becker radio that matches the virtual cockpit's visuals and functions. Added an ADF radio to the IFR cockpit. Added a cold and dark switch to the manager interface. Minor programming updates to the payload manager interface in order to improve interaction with the mouse. Magnetic compass now rolls and banks. Multiple background programming updates in order to improve performance and stability and to fix certain event flooding issues. This update requires the Bf 108 at version 1.1/Service Pack 1 to be installed on your computer. Older versions are not supported. To download the service pack click on "Start/All Programs/Classics Hangar/Bf 108 Taifun/check for updates". If you allready added third party repaints to your Bf108, please back up your corresponding FLTSIM entries and re-insert them after the service pack installation. inoperable cooling flaps handle in all Fw190D models fixed. reversed Fw190D-9 exterior paint schemes in 4096 pixel mode corrected. "cold and dark" switch added to the payload manager interface. multiple programming improvements in order to avoid event flooding issues. This Service Pack is only required if you downloaded the Fw190D/Ta152 before 23. January 2014 at the Classics Hangar Shop. To obtain the service pack click on "Start/All Programs/Classics Hangar/Fw190D - Ta152/search for updates". Fw 190 D and Ta 152 H for FSX! More details on the product pages . The Classics Hangar is currently working on the third and final edition of the Fw190 trilogy. This last version of the legendary German fighter includes variants of the Fw190D "Dora" and the high altitude fighter Ta152H. Get more details and view progress screenshots in our preview forum.
" A sporty little Oldtimer that fully convinces both aeronautically and in it's detail richness. You can read the German language review here with kind permission by FS Magazin. Messerschmitt 108 SP 1 released! The pilot now has company in the cockpit. New passenger figures on all seats are visible in exterior view, configurable using a new manager interface. The new real time manager provides quick access to fuel and payloads and to a number of commonly used simulation commands. In preparation for the comming cold season there is now a visible and audible preheating aggregate available that facilitates engine cold start and helps avoiding engine wear. For a complete description of all features please visit the product pages and read the updated user manual. Existing customers can redownload and reinstall the product at no cost at their vendor's website. We are proud to announce the release of our latest creation, the iconic German touring plane of the 1930th, recreated to Classics Hangar's award-winning detail for Microsoft Flight Simulator X. We will soon release our latest creation , the Messerschmitt Bf108 Taifun for FSX. See some screenshots of the upcoming release at the preview pages. This update adresses an issue that has been reported by users that causes the engine sounds to hang at a high rpm sound when switching from cockpit view to external view and vice versa. It also adds the FSX sound cone technology to the Fw190 engine sounds. The update can be obtained by clicking at the "check for updates" link in your start menu/classics hangar folder, respectively the Flight1/Classics Hangar folder if you own the compilation. There are separate update file each for Early Variants, Late Variants and the CD/Download Compilation. 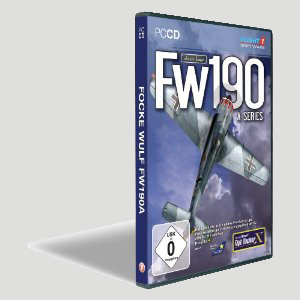 We are proud to announce the release of the Fw190A CD edition in cooperation with Flight1! The CD includes a selection of the most important variants of our award-winning Fw190A early and late variants packages. Depicted are the variants A-3, A-4, A-5, A-8 and A-9 with a total of 21 historical paint schemes. Now available at the Classics Hangar! Classics Hangar is two years old now! By September 2008 we began developement of accurately researched flight simulator addons. We'd like to take the opportunity to thank all our customers and partners who have supported us. To celebrate our anniversary we offer a 30% discount on all Classics Hangar products during all of September 2010. The Classics Hangar has moved house! Please check the imprint link at the header to gather our new postal adress and support telephone number. We have entirely reworked our Fw 190 A, The Early Variants to bring it up to the standard of our award-winning Fw 190 A, The Late Variants package. Check the product pages for details. If you have previously purchased Fw 190 A, The Early Variants, you can upgrade to Version 2.0 at no cost. Just re-download the package from the shop. Don't forget to check the system requirements! Avsim Review "Fw 190 A, the late variants"
Avsim's Senior Staff Reviewer David Wilson-Okamura took a close look at our Fw190A. Due to extensive changes in the systems of our credit card service provider we are currently unable to accept credit card payment. We are working on it to bring the service back online as soon as possible.